In a speech at the Argonne National Laboratory, Pres. Obama reiterated the Energy Security Trust proposal made during the State of the Union Address, proposing a $2 billion research program to speed up clean vehicle technology development. In a speech at the Argonne National Laboratory on Friday, Pres. Obama reiterated a call on Congress to to establish a new Energy Security Trust (EST) that would invest in breakthrough research focused on developing cost-effective transportation alternatives. 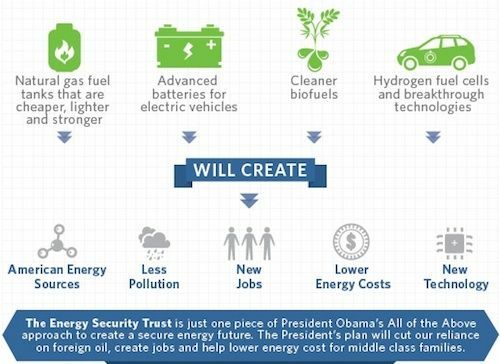 Obama's proposal would earmark $2 billion over a 10 year period (only $200 million a year) to support research into a range of technologies such as advanced electrified vehicles, biofuels, fuel cells, and domestically produced natural gas. The money would be set aside from royalty revenues generated by oil and gas development in Federal waters of the Outer Continental Shelf (OCS). President Obama referenced the EST concept during his 2013 State of the Union address. The basic concept comes from the Energy Security Leadership Council (ESLC) project organized by the non-partisan organization Securing America’s Energy Future (SAFE). That group is led by Co-Chairmen Frederick W. Smith, Chairman, President, and CEO of FedEx Corporation; and General P.X. Kelley (Ret. ), former Marine Corps Commandant and member of the Joint Chiefs of Staff. The Obama Administration describes the ESLC proposal as "supported by a broad bipartisan coalition including retired military leaders." Further the proposal will provide "a reliable stream of funding" for what the Administration calls critical research, because these royalty revenues are projected to increase over the coming years "based on a combination of leasing, production, and price trends." Coupled with the increase in the CAFE Standards requirements, this sort of research "would help solidify America’s position as a world leader in advanced transportation technology," according to the Administration's fact sheet. According to a White House blog post, the goal is to shift America’s cars and trucks off oil entirely. The Energy Security trust does this, according to the Administration, by invest in "research that will make future technologies cheaper and better." As the Administration notes, U.S. fossil oil imports have fallen the last few years, and this has had a positive impact on national energy security even though the U.S. is still extremely dependent on foreign fossil oil.